This started life as a pencil drawing, which I think I've posted before in some form (though not here on DA). This version is completely re-done on my computer. I was wondering if you would take a commission? 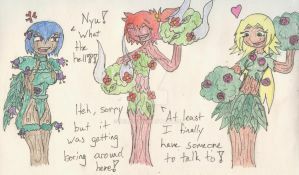 A one or two page comic panel that starts with an OC of mine wandering into this forest at night, and ending with a full transformation into a tree? Cool tree tf, well done. puedo dibujar algo con tu idea? Si, si quieres/ Yes, if you want.